The City of Thunder Bay was formed 01 January 1970 by the amalgamation of the cities of Port Arthur and Fort William, and the townships Neebing and McIntyre (Wikipedia). Town of Port Arthur authorized to construct and operate street railways 1891 (Ont.) Service extended into Fort William from 01 June 1893. Lines in Fort William sold to the City of Fort William 11 March 1908. Both systems were then operated by a joint commission 11 March 1908 - 30 November 1913 with cars lettered Port Arthur & Fort William Railway. Name changed 1909. (RFC). Joint commission operating Port Arthur and Fort William systems dissolved 30 November 1913. Name changed 1914. (RFC). Municipal operation. 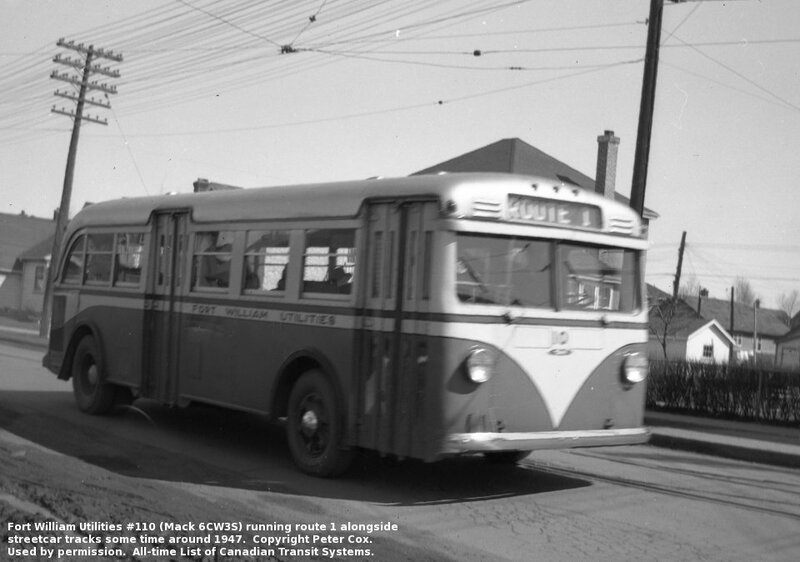 Introduced electric trolley buses 1947. 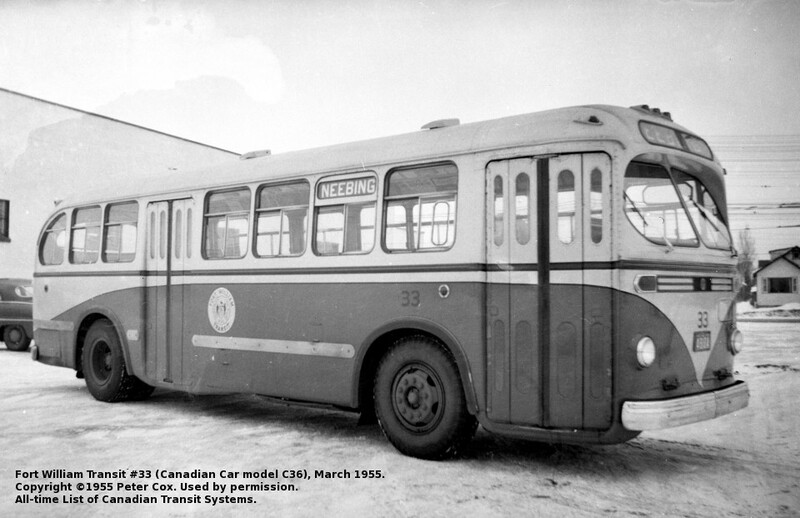 Discontinued electric streetcars 1948. Also called Port Arthur Transit. The intercity trolley coach line was interlined with FtWTCo (both operators' coaches serving the whole length of the line) from its opening in 1947 to 1955 and again from 01 October 1969 (TBB). 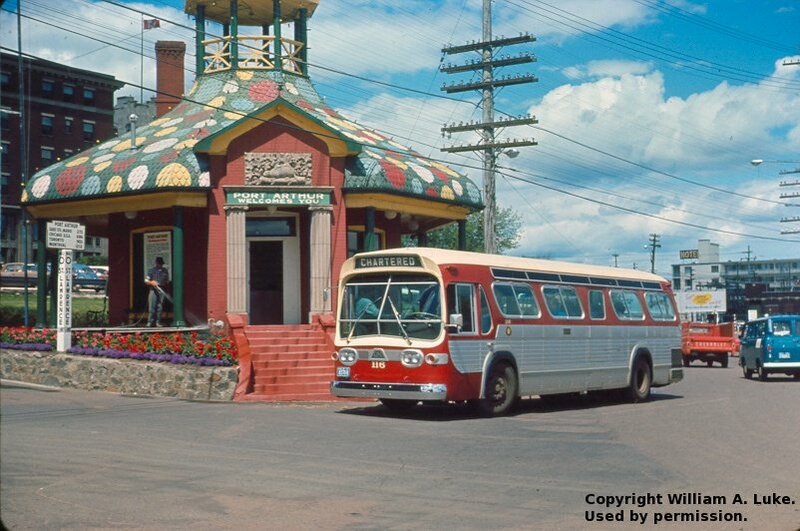 The cities of Port Arthur and Fort William merged to form Thunder Bay 1970. (photos William A. Luke, Peter Cox). 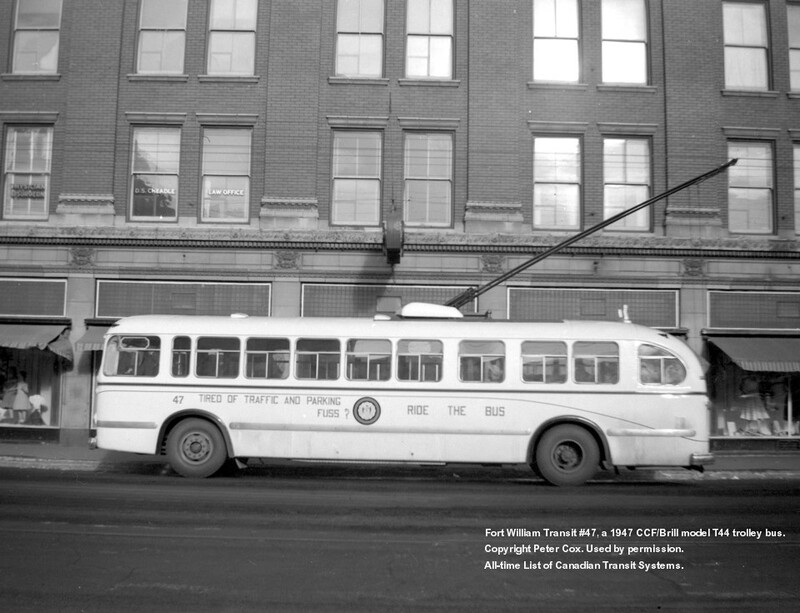 Omnibus operator connecting the PASRy terminus at the Fort William town limits with downtown Fort William. 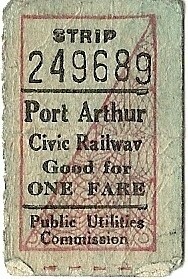 Port Arthur street railway service extended into Fort William 01 June 1893. City of Fort William authorized to build street railways and to acquire already operating parts of the PACRy within Ft. William 1908 (Ont.) Fort William and Port Arthur street railways operated by a joint commission 11 March 1908 - 30 November 1913 with cars lettered Port Arthur & Fort William Railway. Independent operation began 01 December 1913. 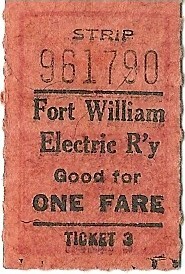 Tickets lettered Fort William Electric Railway. (RFC). The intercity trolley coach line was interlined with PAPUC (both operators' coaches serving the whole length of the line) from its opening in 1947 to 1955 and again from 01 October 1969 (TBB). 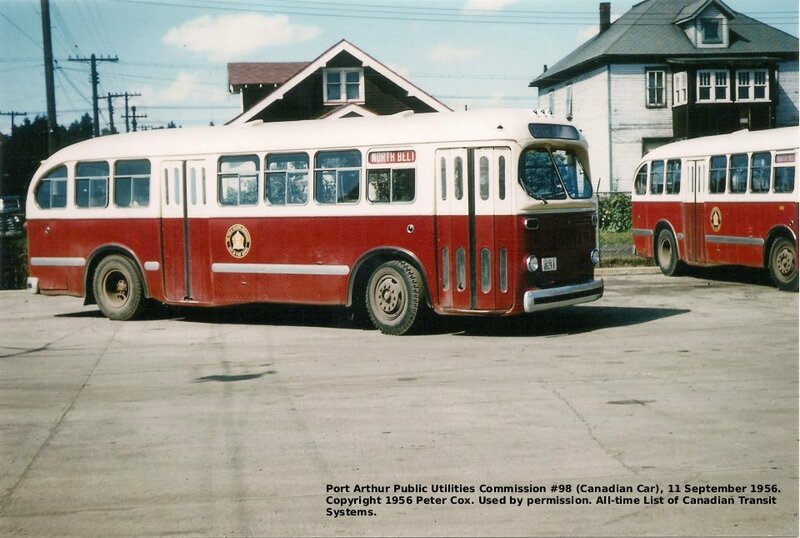 Photographs show buses lettered Fort William Utilities (Luke & Metler, p. 38). The cities of Fort William and Port Arthur merged to form Thunder Bay 1970. (photos Peter Cox). Incorporated 26 April 1904 (Ont.) A five mile (8 km) line from connection with the Fort William street railway to Neebing and Paipoonge townships. Initially operated passenger service by gas car. Frequent service from Fort William connection to Neebing cemeteries commenced 03 August 1915, which was electrified June 1917. Through running (including gas car) over Fort William Street Railway trackage to city centre begun 29 June 1918. Whole line leased, operated and electrified 1923 by the municipal FtWStRy. FtWStRy discontinued service and Company abandoned track west of CNR yards 1945. Lease, and operations, of the final 2½ mi. (4 km) ended 1947. (Chochla). Cano, Dave, Fort William and Port Arthur Streetcars..... , website 2010. Chochla, Mark, “A Radial Venture: The Mount McKay and Kakabeka Falls Radial, 1904-1947”, Papers and Records , Vol. XXXIX (2011) 3-28, Thunder Bay Historical Society.